Our brewing process is virtually unchanged since our great, great grandfather, Peter Straub, perfected it in 1872. 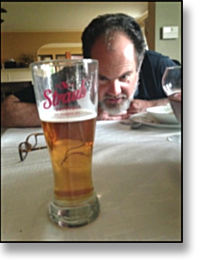 In 2009, a Quality Control Department was added to the Team at Straub Brewery. Each and every day (Yes, all 365 days a year!) 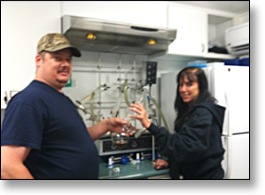 our Lab Technicians thoroughly test the liquid from start to finish assuring that you get the upmost quality beers from Straub. This golden liquid will end up at your favorite Beer Distributor, Bar, Tavern or Club, or straight into a beer at the Eternal Tap! We begin with the freshest water around! The spring-fed mountain water we use is from the Laurel Run Reservoir, and since St. Marys, Pennsylvania sits atop the Eastern Continental Divide, water that falls here only has three choices — drain to the Gulf of Mexico, drain to the Chesapeake, or end up in the finest beers made anywhere – Straub Beer! As the water runs into our brewery, it is mixed with corn flakes and crushed malted barley. The starch from the grains is converted into fermentable sugar by the natural enzymes contained in the malted barley. The mixing process lasts for 2 hours at temperatures ranging from 104 to 170, producing a sweet golden syrup called wort. The wort is slowly drawn through a copper vessel called a grant, where it is visually inspected for clarity and color. Next, the hops are added as the wort is transferred through the grant to the brew kettle, where it is boiled for 2 hours. The heated mixture is held in a separate vessel called a whirlpool for short time before being cooled to approximately 58 as it passes through an enclosed wort-cooling system at a rate of one barrel per minute and then proceeds to the fermenting tanks. 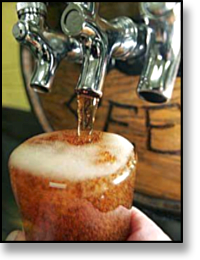 The fermenting process begins with a pitching of yeast into the unfermented beer as it is being cooled. The fermenting process takes seven days, during which time the yeast will consume the fermentable sugars in the wort, producing beer. After the fermentation process is completed, the beer is transferred to the cellar for aging and filtration. At this stage, we continue the process which is called polishing, where we use filtered carbon dioxide which is injected into the beer. When the beer is finished, it is either racked in kegs, sent to the bottle house for packaging, or for your enjoyment atour Eternal Tap!